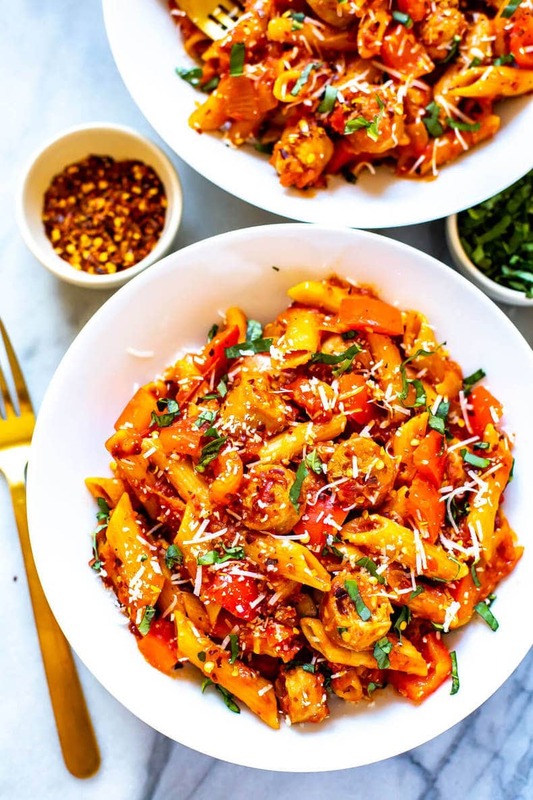 This Spicy Penne Arrabiata is a healthier pasta recipe featuring a spicy tomato sauce with bell peppers. This Italian pasta dish comes together in 30 minutes and in one pot for easy clean up! In a large pot, heat 1 tbsp olive oil on med-high heat. Add turkey sausage, searing for about 2-3 minutes per side. Using tongs, remove sausage and when cool, slice into bite-sized pieces. Meanwhile, add onion and garlic to pot and sauté for about a minute. Add sausage pieces back into pan, add salt, pepper and red chili flakes and sauté for another 2-3 minutes. Add diced tomatoes, tomato sauce and water and bring to a boil. Add penne, then cover with lid and cook, stirring occasionally, for another 8-10 minutes until pasta is fork tender and most of the liquid is absorbed. Stir in red pepper, and cook for another 2-3 minutes. Serve hot with grated parmesan and fresh basil overtop!